Eight new satellites have been ordered for Galileo - Europe's global positioning system. As before, they will be made by the German-UK consortium comprising OHB-System of Bremen and SSTL of Guildford. 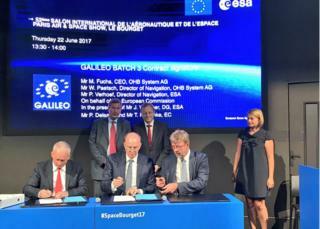 The industrial contract was signed at the Paris Air Show on Thursday by OHB and the European Space Agency, which is procuring Galileo on behalf of the EU. Europe's GPS has enough spacecraft for a full constellation already but this order ensures sufficient spares. It will provide leeway as some of the first satellites that were launched into the network are retired. This is the third straight contract win for OHB-SSTL. There are even options in the new order to add further units - of two, four or six extra satellites. Speaking at the Paris Air Show earlier this week, Fritz Merkle, the head of marketing at OHB, said the consortium was hoping for early clarity on whether these options are likely to be picked up. "We will be ordering components from our suppliers and there is a big difference if we are ordering those components for eight, 10, 12 or 14 units. If we have a gap between the orders - that will affect the price," he told BBC News. The announcement of the new work order is a big fillip for SSTL, which as a UK company has been nervous about its position in the project given that Britain is about to leave the European Union. There are implications which the consortium, the European Commission, Esa and the London government will somehow have to pick their way through over the course of the next year and a half. One of the issues relates to the classified nature of some aspects of the satellites' design. Only a company in the EU is permitted to work on these elements. SSTL's part in the production process is to assemble the payloads for each spacecraft, and it is obvious even now that not all units will have left Guildford by 29 March 2019 - the official date of Brexit. "Industry is very much aware of the issues and their responsibilities and obviously we're in touch with them to understand what the impact is on the programme," said Paul Verhoef, Esa's director of navigation. "We will be working with them to find solutions, but we would leave it in the first instance to them to decide how to handle it." The obvious solution is that the Commission and the UK reach a deal or some transitional arrangement in their Brexit negotiations that allows the German-UK consortium to continue as before, moving equipment and people seamlessly between them across the Channel. If that is not possible, some creative solutions will need to be sought. For the moment, though, SSTL is delighted with another contract win. "It's great news for the team here in Guildford," said Gary Lay, the director of navigation at SSTL. "Galileo provides an important foundation for us. It gives us long-term certainty that makes sure our facilities are used. And that allows us to do all those other exciting, innovative and agile things that we like to do." There are currently 18 satellites orbiting in the Galileo constellation, with another eight from the previous work order still to fly. Twenty-four satellites are regarded as a fully operational system, but the idea is to have six spacecraft in orbit to act as spares should any failures occur. The next four satellites should launch on an Ariane rocket towards the end of this year. Some of the existing satellites have experienced problems with their atomic clocks. These devices are used to generate Galileo's precise navigation and timing signals. The problems have not yet impacted the performance of the satellites, but engineers have had to change the way the clocks are managed in orbit. "And we're taking the opportunity of the new work order to do some design strengthening," Mr Lay told BBC News.